Forbidden to all except black people? Or is it just it do. They’ll look great on your prosthetics. So It’s OK if I fall carefully into the tunnel? Jumping into the train tunnel? Naturally, you’ll wear trainers. 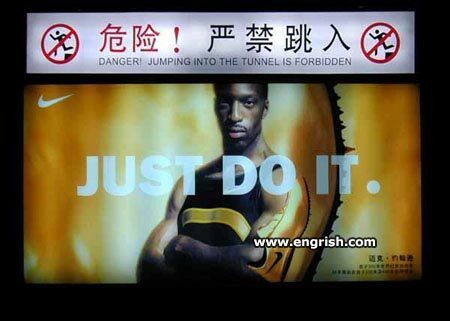 Not Engrish but a poor location of advertising. It probably depends on whose tunnel. The “Light at the end of the tunnel” is often an express train heading at you. ‘Ahm Cess. Pucker up baby. Nike got their slogan switched with that of the Libertarian Party. To jump or not to jump…that is the question. Take therefore no thought for the morrow: for the morrow shall take thought for the things of itself. My little Asian lady loved me jumping into the tunnel. But first I had to spend lots of time, to earn the right to. You say “forbidden”; I say “already did it”.